. 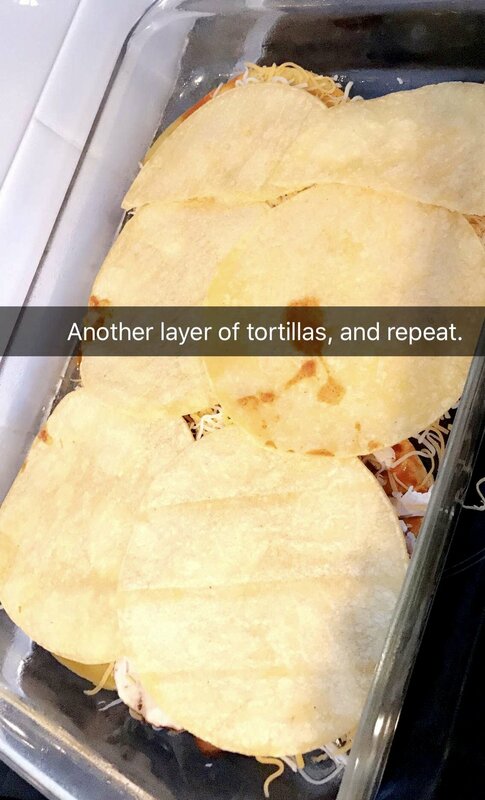 Cook all tortilla before layering it on a Pyrex dish. Lay the tortilla on the Pyrex Dish and spread Enchilada sauce all over it. Layer on chicken, mushroom, and cheese throughout the top. Then put on another layer of tortillas, Spread the enchilada sauce on top and repeat the process with chicken, mushroom and cheese. Because I have kids I only put chicken and cheese on one side. This is optional, cut up some green onions, ,olives, and tomatoes to top my enchilada. Once I completed 2 layers, I finished it off with tortilla, and a bunch of cheese. Then I put it in the oven for 20minutes at 350 degrees.